Home > Law Books > Practice Materials > Federal Postconviction Remedies and Relief Handbook with Forms, 2019 ed. 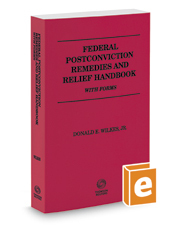 Federal Postconviction Remedies and Relief Handbook with Forms, 2019 ed. The Author's Comments are a key part of this handbook. They furnish an overview of and valuable background information about the federal statutes or rules included in the handbook.